The Sheldon Jackson Museum will host the first part of a two-part holiday At Saxan Art Activity on Saturday, November 24th 10am- 11am in the museum gallery. 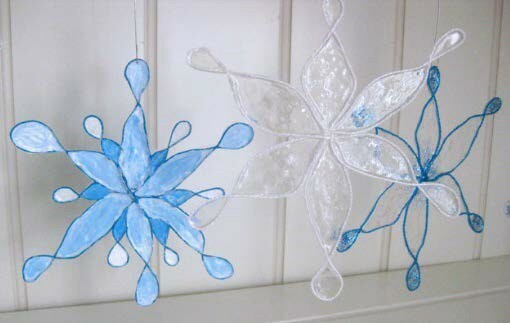 Join us and make snowflake ornaments that look like stained glass. These make a lovely holiday gift! This project will involve using glue, wax paper, yarn, and Elmers glue. Come dressed to get messy. The second part of the this At Saxan when we finish making the ornaments will take place Sat., Dec. 1st at 10am. Participants must attend both parts to complete the ornament. The Nov. 24th and Dec. 1st Art Activities are best for children ages 8-11. Younger children may attend, but help from an adult may be useful. At Saxan Art Activities are sponsored by the Friends of Sheldon Jackson Museum and free. Registration is required. Call (907) 747-8981 to register. The Sheldon Jackson Museum is open Tuesday through Saturday from 10am to 4:00pm. Admission is $5 for general visitors, $4 for seniors, and free for ages 18 and under. However, admission will be waived for the At Saxan Art Activity. Please call (907) 747-8981 with any questions about the museum’s programming.